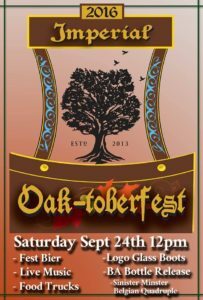 Home Events and Releases Oaktoberfest Saturday 9/24! DAS BOOT IS BACK! 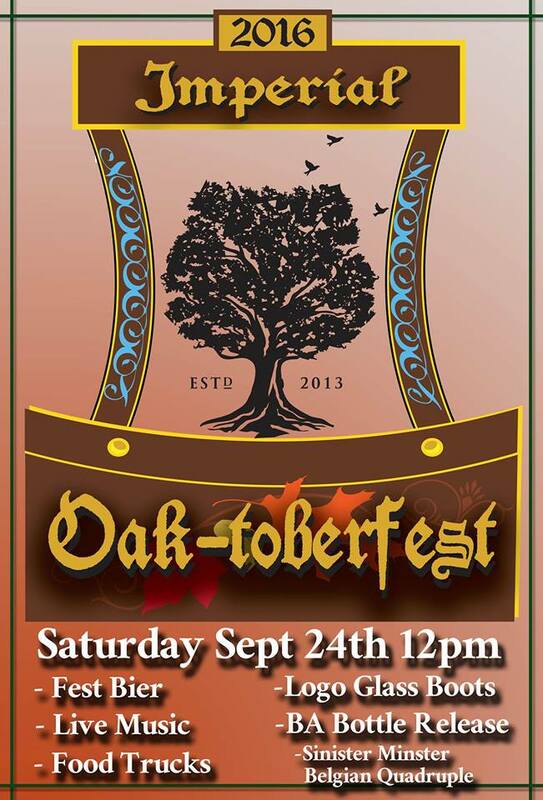 Join us Saturday Sept 24th for our 3rd Annual Imperial Oak-tobefest celebration! Here are the details. -Commemorative 1/2 Liter Drinking Boots available for sale starting at noon. $15 includes your first fill, $5 fills after. -Rum barrel aged “Sinister Minister” Belgian quadruple, bottle release and tapping at 12pm. Bottles are $15, will be sold from the adjacent storage space, and limit will be announced day of. -Starting at noon- Burger Antics, Pierogi Wagon and Arnolds Tacos. -Starting at 4-5- Pizza Boss, Roaming Hog, Toasty Cheese. Crank It Hop- Experimental Hops Series!